Born on November 7th 2012. Gaia is a very sensitive and delicate cirneco dell etna. She trusted me rather quickly, and now I have a "tail", which accompanies me, walk near my heels continously, all day long. There is maybe... one small inconvenience. Gaia has no barriers, fences or boundaries of any kind ... She'll search me everywhere and always, even if she needs to jump over the 2 meter high fence .... It is appropriate to use the expression "she goes through fire and water for me" ... I am each time relieved she didn't break her leg. 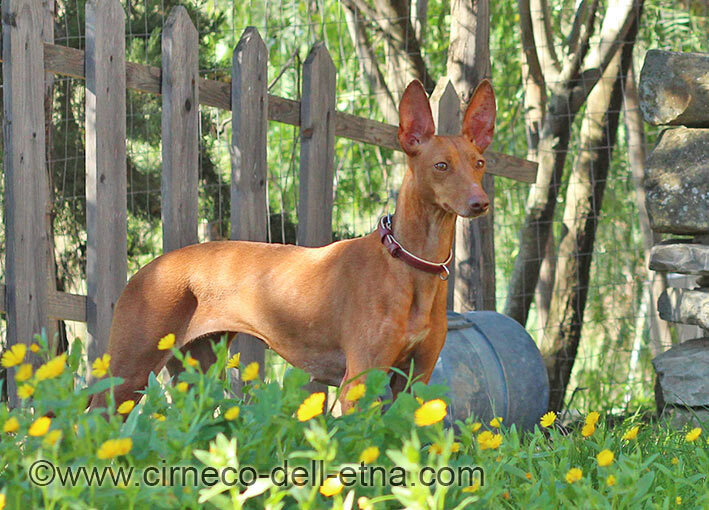 Worried about once she will..
She is the daughter and granddaughter of the famous Sicilian cirneco Willy, of Irene Magri. The line which I will carefully cherish. I am very happy that Gaia crossed our path. And I hope that we not disappoint her.